Surprise! We’d been up to Vanderbilt for our last clinic visit before the planned c-section and had just finished our tour of L&D; and were walking to the car to head home when baby Adelaide must’ve decided she liked the place so much she wanted to stay. Amanda’s water broke and so we went right back in and now baby Addy’s here! 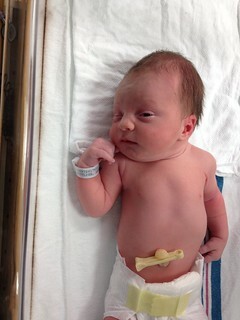 She was born @ 13:01 on the 17th and weighed in at a healthy 6 lbs 11 oz at 19 1/w inches. It’s that time of year. Time to watch favorites like “How the Grinch Stole Christmas” (the real one, not that live-action debacle starring Jim Carrey and directed by Ron Howard) and “A Christmas Story” (they looked at me like i had lobsters crawling out of my ears!). Seems like Christmas has rushed up to me before I had a chance to notice. Fortunately I was able to get the little bit of shopping I wanted to do done yesterday, and no it wasn’t nearly as bad as I had feared.